City of Old Castile, having a long-established, large, wealthy, and cultured Jewish community up to the time of the expulsion of the Jews from Spain in 1492. It is reported that the Jews of Burgos, who as early as 1070 had made a loan to the Cid, organized a large squadron in 1123, and fought bravely against Sancho Aznar, as faithful subjects of the king of Castile (Sandoval, "Historia de los Reyes de Castilla," p. 132a, Pamplona, 1634). The Jews of the city, "in sustentatione pauperum," were compelled to make an annual donation of two solidos and one denar to the hospice presented by the king of Castile to the church there (Florez, "España Sagrada," xxvi. 472). Special privileges, and immunities against the arbitrary acts of officials, were granted to the Jewish residents by Ferdinand III. and Alfonso X. (the Wise), and were again confirmed by D. Sancho el Bravo on April 23, 1295. The era of greatest prosperity extended from the close of the thirteenth century to the middle of the fourteenth; the taxes in 1290 amounting to 87,760, and the various other imposts to 22,161, maravedis. The Cortes assembled in this ancient diocese in 1301, 1315, and 1345 gave considerable attention to the charges of usury brought against the Jews, who were occupied as merchants, tradesmen, and mechanics. In the civil war between King Pedro the Cruel and Henry de Trastamare, the Jews of Burgos remained faithful to the king. The story goes that when the archbishop proposed to surrender Pedro on the ground of the latter's devotion to Judaism, the Jews of the city agreed, declaring that the inclination of a Christian for Judaism is as much a defection as is the conversion of a Jew to Christianity. This story, however, is a pure invention. In reality they offered obstinate resistance to Henry de Trastamare; fortifying themselves in their quarters (Juderia), and replying to Henry, when summoned to surrender, that they could recognize no ruler other than their legitimate sovereign, for whom they were willing to sacrifice their lives (Aboab, "Nomologia," p. 290). 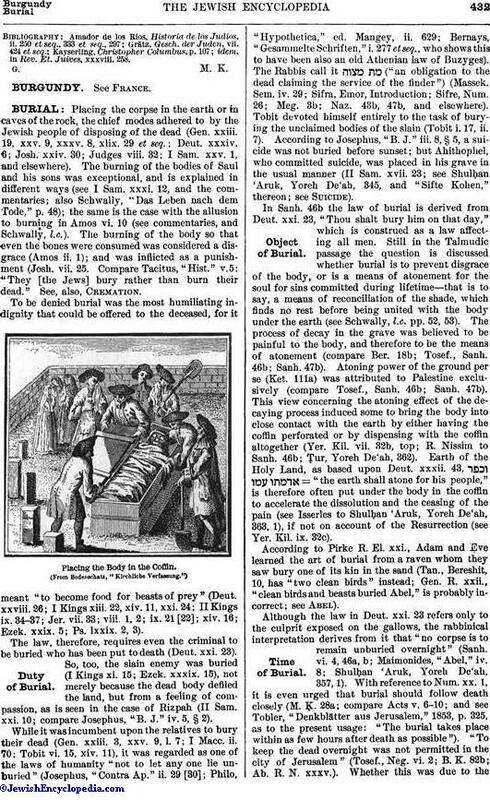 This fidelity to the vanquished ruler met with the frank admiration of the victor Henry, who nevertheless, according to the reports of both Jewish and Christian chroniclers (Ayala, "Cronica," year 18, ch. xxxv. ; Samuel Ẓarẓa in "Shebeṭ Yehudah," ed. Wiener, p. 131), imposed a fine of 50,000 doubloons, or 1,000,000 maravedis, which reduced the Jews to such extremity that they were compelled to sell the crowns and ornaments of the scrolls of the Law. Those unable to pay their contribution were sold into slavery, and all debts payable to Jews were ordered to be canceled. On the day of the coronation of Juan I. (1379), Yusaph Pichon, the chief tax-collector of Henry II., was executed by the Jews as a "malshin" (slanderer). The king, whose authorization had been surreptitiously obtained, was incensed at this act, and ordered the death of the Jewish executioners, Zulema and Zag, as well as of the "Merino Rabbi Mayor [chief rabbi] de la Juderia Burgalesa." 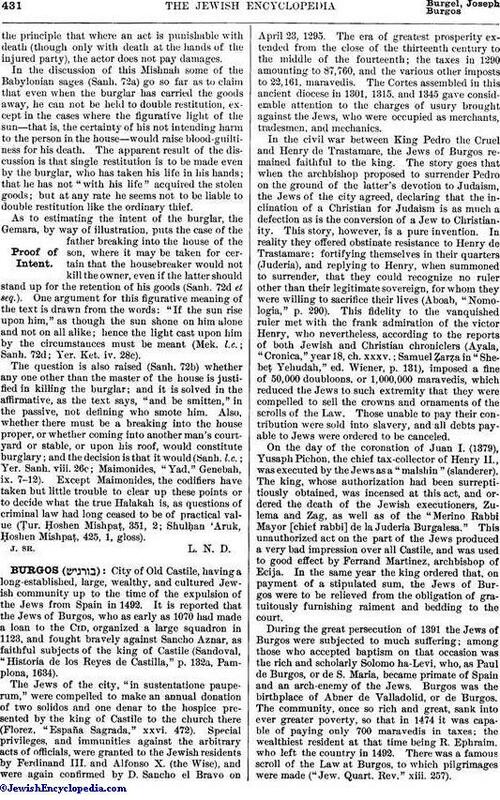 This unauthorized act on the part of the Jews produced a very bad impression over all Castile, and was used to good effect by Ferrand Martinez, archbishop of Ecija. In the same year the king ordered that, on payment of a stipulated sum, the Jews of Burgos were to be relieved from the obligation of gratuitously furnishing raiment and bedding to the court. During the great persecution of 1391 the Jews of Burgos were subjected to much suffering; among those who accepted baptism on that occasion was the rich and scholarly Solomo ha-Levi, who, as Paul de Burgos, or de S. Maria, became primate of Spain and an arch-enemy of the Jews. Burgos was the birthplace of Abner de Valladolid, or de Burgos. The community, once so rich and great, sank into ever greater poverty, so that in 1474 it was capable of paying only 700 maravedis in taxes; the wealthiest resident at that time being R. Ephraim, who left the country in 1492. There was a famous scroll of the Law at Burgos, to which pilgrimages were made ("Jew. Quart. Rev." xiii. 257). idem, in Rev. Et. Juives, xxxviii. 258.